The most romantic name of Central Asia, Samarqand, isn't as exotic as it sounds. Architectural gems stand like anachronisms amidst the cold, twentieth century concrete blockhouses and grid-iron streets, a copy of every other unremarkable industrial town across the old Soviet Union. Somewhere between Timur and today Samarqand lost its soul. The grand buildings don't rise from a rambling old town, their mystique isn't supported by a spice atmosphere, unusual bazaar shops, or people in tune with the past; beyond the facades of thousand year old medressas operate tacky gift shops. 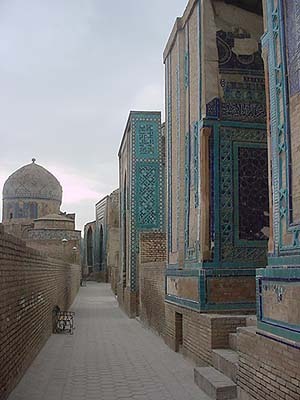 Samarqand isn't a cultural experience; it's a tourist attraction. We can't find a vibe about how life might have been in this famed place. Despite our disappointment, we admit it is an excellent place to see, if not feel, the magnificent, empty shells of Timurid architecture, enough to be remembered. 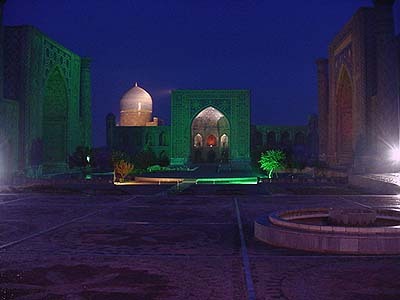 Guri Amir Mausoleum, which means 'tomb of the emir.' 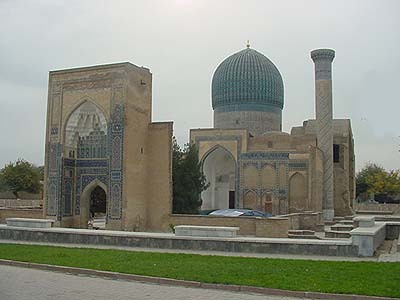 In this modest place lie the graves of Tamerlane, his sons, grandsons, and revered teachers. In 1941, a Soviet anthropologist verified that Timur stood tall at 1.7 meters and lame in the right leg. He also found an inscription that said, 'Whoever disturbs this grave will be defeated by an enemy more fearsome than I." The next day Hitler attacked the Soviet Union. Inside Timur's mausoleum: the pole with horse hair on top marks the grave of a Muslim saint, Sheikh Umar, one of Timur's revered teachers. 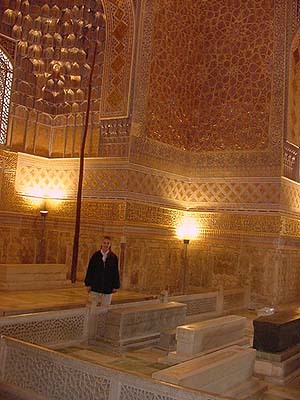 Timur's crpyt lies beneath the jade stone on the right. The most solemn place in Samaqand: Shahr-i-Zindah, a neighborhood of the dead. Many tombs stand here, the most important one is Qusam ibn-Abbas, a cousin of the Prophet Mohammed.